The viewer can socially participate in this spontaneous captured moment. The three figures of man, child and woman in the foreground suggest a family unit and, from the title, leisure and a day out. The father and child represent a social renewal, as the men are free, no longer a part of military processions commonly seen during the war years. Standing on steps to gain a better view, the group forms a solid triangular shape with the child at the apex representing the future, or possibly a generational sacrifice to a future war. This human geometric composition taken from a low viewpoint is underpinned by the small triangular shapes of collars and hats as the clean whites zigzag up the image. 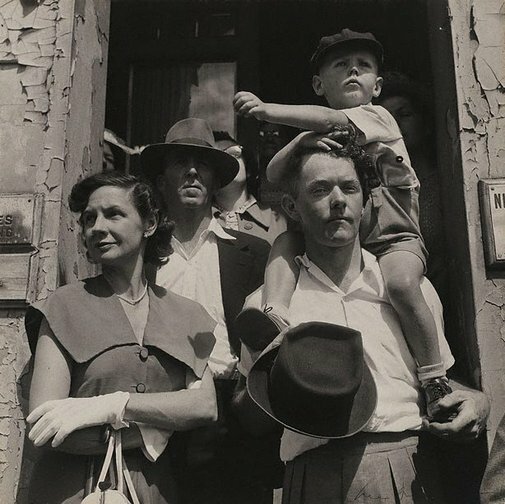 The politics of the postwar years emphasised the family, repositioning women into the home to be supported by male breadwinners. Here the arrow-like hat points to and suggests a socially secure future. Signed and dated l.r. image, pencil "Max Dupain '52". Rose Peel, Photography: Art Gallery of New South Wales Collection , 'Australian postwar photo-documentary', pg.189-207, Sydney, 2007, 190, 191 (illus. ), 193, 198 (illus. ).